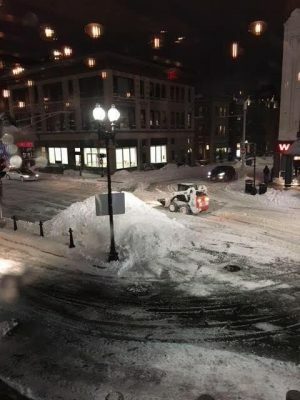 The winter weather did not stop the 70th Annual Eastern Athletic Trainers’ Association (EATA) Meeting and Clinical Symposium from being held in Boston, MA on January 5th-January 8th. The 4-day conference started off with an Educators Conference in which numerous professionals presented information on competency based learning, fostering clinical capabilities, incorporating research components, and integrating evidence based practice within Athletic Training Education. The Educator’s Conference also included a Profession Development & Peer to Peer Session. Jessica Barrett and Dr. Stephanie Mazerolle, both members of the UConn Department of Kinesiology, facilitated the Young Educators Peer to Peer Session. The EATA Student Program provided additional opportunities for student learning and involvement. The annual District 1 and District 2 Quiz Bowls were hosted Friday night. Patrick Coley, a senior in UConn’s undergraduate Athletic Training Program and the President of UConn’s Athletic Training Society, represented UConn during the District 1 Quiz Bowl. Presentations as part of the Student Program included topics such as Blood Flow Restriction Therapy, Current Topics of Concussion Evaluation and Management, and Prosthetics. 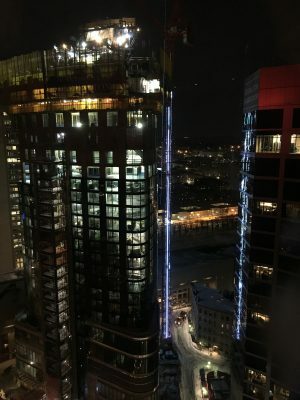 There was a panel presentation known as “Stories from The Sidelines” in which panelists discussed their involvement in caring for victims of the Boston Marathon bombing and introduced the ATs Care peer support group. 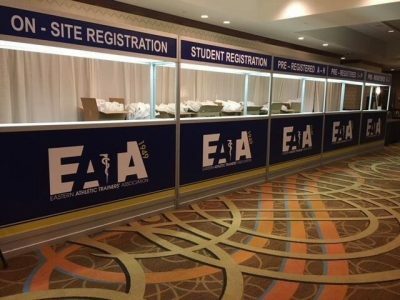 The EATA General Session included a wide variety of presentations including injury response behaviors, eating disorders, athletic insurance, concussions, healthcare communication, and the rehabilitation and treatment of athletic-related injuries. Attendees also had an opportunity to earn evidence based practice continuing education units which are part of the Athletic Training Board of Certification continuing education requirements. 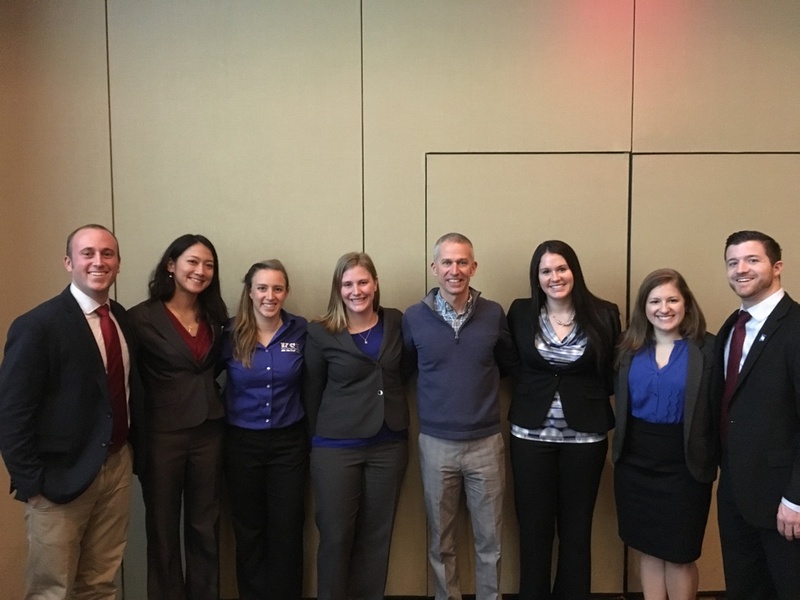 Members of KSI had the opportunity to not only attend the conference, but also share recent research with the Athletic Training community. Dr. Douglas Casa presented a lecture titled “The KSI State Rankings of Health and Safety Policies for High School Athletes: What it Means for the EATA Member States.” Dr. Casa discussed the rankings of the 51 State High School Athletics Associations which were released on August 8, 2017. The states were ranked based on a 100-point rubric that assessed compliance with the current best practices for health and safety in high school athletics. Dr. Casa focused on the EATA member states and provided suggestions and strategies for improving health and safety standards. Kelly Coleman presented original research in the form of a poster presentation titled “Junior Faculty Knowledge of Institutional Expectations for Tenure and Promotion.” Justin Rush also presented a poster titled “Spatting Increases Ankle Stability in Collegiate Field Sport Athletes: A Critically Appraised Topic” from his undergraduate work. 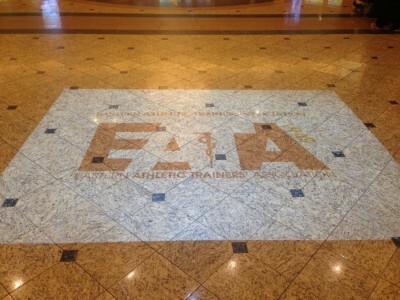 As always, the EATA provided a great weekend of education, sharing important research, and networking. Next year’s conference will be held in Valley Forge, PA. We hope to share more research from KSI in the future to continue to educate others and promote the Athletic Training profession. 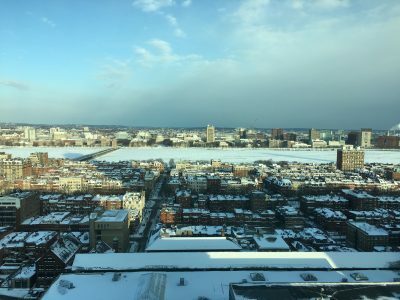 This past weekend KSI traveled to Boston, MA for the Eastern Athletic Trainers’ Association Annual Meeting. 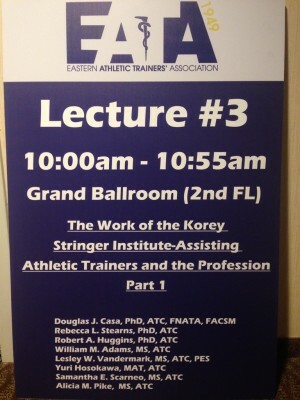 KSI had the great opportunity to present during a 2-hour symposium on the recent projects, initiatives, and accomplishments of KSI to the EATA membership. The presentation was very well received and we received a lot of positive feedback following the talk. 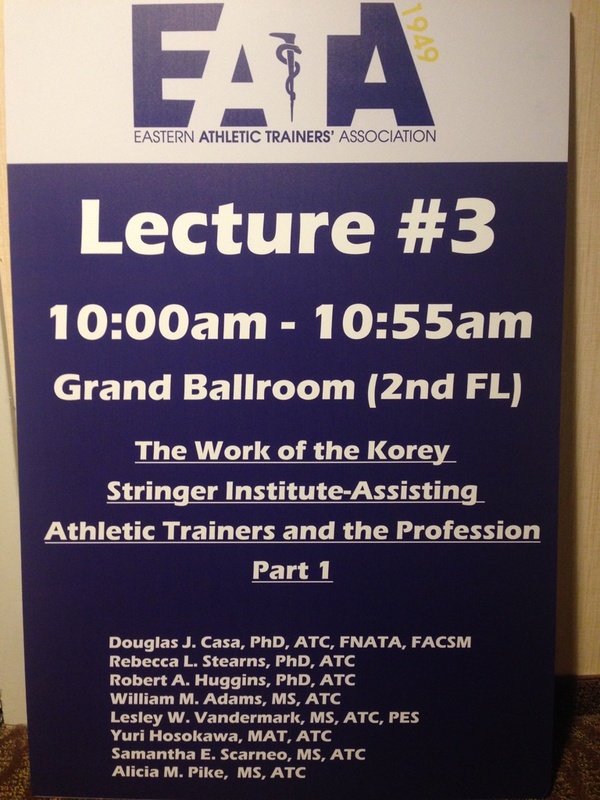 The talk titled, The Work of the Korey Stringer Institute-Assisting Athletic Trainers and the Profession, was presented by 8 of the staff from KSI. Doug Casa, began the symposium discussing the latest updates on policy changes at the high school level and how policy changes can save athletes lives. Rebecca Stearns followed discussing heat tolerance testing and how KSI has been active in this service area in helping return Exertional Heat Stroke Victims back to full activity. Yuri Hosokawa discussed how KSI utilizes Social Media to share our current initiatives and latest sports medicine related news to our followers. Lesley Vandermark, Alicia Pike, and Samm Scarneo presented KSI’s work related to investigating the extent of AT services at the high school level. Vandermark presented the results from the Benchmark Study published in Early 2015 by former KSI staff Riana Pryor that showed the extent of AT coverage in public high schools across the United States. Pike followed up with the recent data collected looking at the extent of AT coverage at the Private School setting across the country. Scarneo closed out this topic discussing the ATLAS project, which KSI is partnered with the NATA in helping map the AT services across the United States using an interactive geographical map. Rob Huggins presented the available data we have on the insurance initiative that we are working on for the NFL. This project is focused on investigating the potential cost savings from an insurance perspective for high schools employing a full time athletic trainer. Lastly, William Adams presented on the current work KSI is doing in the world of wearable technology from both an athlete monitoring perspective and current research being conducted examining the validity and efficacy of using wearable technology in measuring hydration status during exercise. We are hoping to get the chance to present our current work at other district/regional AT meetings to keep other Athletic Trainers aware of what KSI is doing and how KSI is promoting the profession of Athletic Training from many different avenues.